In 2011, Gartner group outlined five strategies for migrating to the cloud which provided a reference for defining and discussing migration strategies in the early days of cloud adoption. Over time, the approaches evolved from five to six definitions that are most commonly used for migrating to the cloud. They’re regularly referred to as the six R’s: rehost, replatform, repurchase, refactor, retain, and retire. As a disclaimer, every migration will be unique, so these strategies are not mutually exclusive or definitive, but rather guidelines. 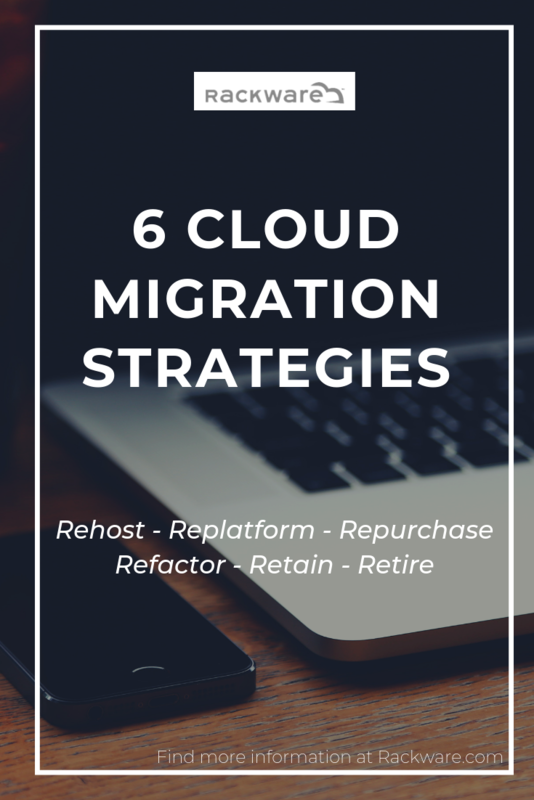 The six R’s can be used as discussion starters when facing cloud transformation, or at times, all six strategies can be used in a migration project. Rehosting is often referred to as lift and shift. Like it sounds, rehosting is generally lifting servers or applications from the current host environment and shifting them into the public cloud of choice. Lift and shift is a popular and widely used strategy for enterprises who are first starting off in the cloud migration journey. Significant benefits come with this type of strategy. Running servers on a scalable pay per use infrastructure of the public cloud platform has low resistance and allows you to work backwards from a strict deadline or constraint. So how does it technically work? The application or server is exported through a third-party tool like VMware’s vCenter or images can be created to then be exported. Modifying rehosting, replatforming amortizes transformation costs. When opportunities are better addressed, major infrastructure upgrades can be realized under replatforming as well. Overall, there are positive impacts on drivers and the cloud can be better optimized. Sometimes noted as drop end shop, repurchasing can result in the decision to move to another product. Existing licenses would be ended and services would be repurposed on a new platform or service. Procuring or upgrading, however, come with disposal, employing, dismissing costs that can be significant. Repurchasing is not needed when applications are written with modern code, as the code can be transported from one provider to another. The repurchase strategy most often pertains to proprietary data based platforms. This strategy is strongly driven by the desire to upgrade service drivers. It is difficult to make improvements in the current environment or when the requirements for advancements have to meet specific terms. To do all of this, refactoring is ultimately re-architecting and re-coding the service drivers. It also depends on whether or not the service is mission-critical or not. If so, then refactoring can occur during the migration stage. It would be best to refactor during the initial steps of migration, otherwise disruption to business operation may be significant. This strategy basically is the option to take no action and do nothing. For whatever reason, there may be portions of your enterprise that you are not ready to migrate to the cloud or feel more comfortable with keeping specific documents on premise. In the case where you want to retain some aspects of your IT services, retainment can take place in the current environment or a hybrid strategy can be implemented. Last but not least, retiring is the strategy in which assets and services are identified as not mission-critical. These can be decommissioned so the business can better focus on services that are more widely used and deliver immediate value. Over the past few years, driving forces for cloud adoption have moved past cost efficiency. Now, the driving forces include the desire for increased business agility, productivity, and optimizing digital innovation. When migrating to the cloud, staff productivity skyrockets as they can focus more on higher value work rather than managing the infrastructure. Employees can adopt new skills that involve modern application development to become more advanced in their field. The benefits of cloud migration reach beyond what it once was. With the application of the six R’s of cloud migration strategies, your business can reap the benefits as well.